Vietsmile Travel has launched a big deal for people who book tours on the website smiletravelvietnam.com. 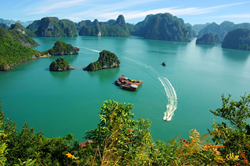 Vietsmile Travel always makes efforts to ensure that each traveler who comes to Vietnam can have a vacation that is truly customized to his or her desires. The most interesting part of Vietnam, also the reason why many tourists come to the country again and again, is that the place is created by the natural beauty and unique culture. Since its tourist attractions are quite varied, Vietsmile Travel expects that those who visit the country can come back again and again and never have the same experience. This is totally possible if tourists have chances to join special festivals and markets in Spring. This April, tourists can find the most interesting time in Vietnam as the weather is entirely great. Vietsmile introduces attractive tours to Hanoi, Ninh Binh, Sapa, Da Lat, Halong Bay, Danang, Hue, Ho Chi Minh City, Phan Thiet, Nha Trang, Con Dao and Phu Quoc. Vietsmile Travel has launched a big deal for people who book tours on the website smiletravelvietnam.com. As released by Mr. Bui Quang Long, the Director of Vietsmile Travel, it will offer a complementary “Hanoi city tour” if tourists book a tour to any destinations in Vietnam including Danang, Sapa, Ho Chi Minh City, Da Lat, Nha Trang, and Phu Quoc. Hanoi is recommended as one of the 25 top destinations in Asia by tripadvisor users. Indeed, the city is the combination of modern and traditional values, alluring tourists from all over the world. Vietsmile Travel always operates daily tours for tourists to visit Hanoi at a surprising price. People who books any tours on the website have the chance to get a complimentary tour in Hanoi. The package includes pick-up car, tour guide, lunch, and 5 beauty spots. Joining this tour, people can visit One-pillar pagoda, Ho Chi Minh Mausoleum, Sword Lake, Temple of Literature, and Old Quarters. Smile Travel Vietnam Company is reviewed as one of the most reputable travel companies in Hanoi, Vietnam by millions of customers. The company aims at 4 main services: hotel booking, Vietnam tours, visa on arrival and airfare. During their 6 years in operation, Smile Travel Vietnam Company has proved to be a good and trustworthy destination for tourists all around the world to have memorable trips in Vietnam.